Since gaining Independence in 1947, instead of being able to eradicate the poverty, India has added poors and houses poorest people in the world. On the top of it, there are millions of poors in India who are living below the poverty line which despite having been drawn at a very low income requirement has not been able to bring the poors above it during last 60 years. Since 2001 and over the last decade, although poverty levels have declined from 37.2% in 2004-05 to 29.8% in 2009-10, a whopping number of 250 million poor people is estimated to be living in India. During the last 6 decades, many poverty eradication and poverty minimization programmes, subsidies to poor people, pension schemes to poor below poverty line (BPL people) and now poll promises in the election year 2019 to ensure minimum income to the poor have been announced. But instead of poverty, these are the poor who are giving up their life due to lack of food, cloth and shelter. The poverty minimisation programmes by various governments in the past and now the policies of Modi Government are well intended, yet the impact is not so much visible on poverty eradication and the people living below the poverty line are still in large number. As such it has become a hot Group Discussion topic for MBA admission. 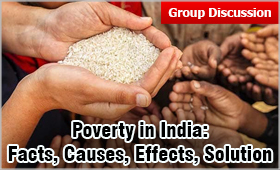 MBAUniverse.com presents an indepth analysis of this MBA GD Topic that analyses the state of poverty in India, facts, causes, effects and solution to the problem. Before moving ahead, it is necessary to understand what poverty means to the modern man and how it is affecting the national as well as global economy. Poverty is determined on the basis of per day and per capita incomes. Poverty comes in lots of variants and phases and is almost invariably tied to the condition of world hunger as a result. In an interview with The Economic Times on 8 September 2014, UN Food and Agricultural Organisation (FAO) Director General, Jose Graziano da Silva said, “Hunger is not an issue of food availability, it is an issue of access. Many people are not able access because they do not have jobs.” This essentially means that unemployment, poverty and hunger all go hand in hand and one cannot be solved while neglecting the other. While the International Poverty line is drawn at an earning of $1.90 per day announced in October 2015 as set by the World Bank based on ICP Purchasing Power Parity (PPP) calculations. This corresponds to what can be bought in US for $1.90 and depicts the poorest of countries in the world. As per the World Factbook compiled by the Central Intelligence Agency (CIA) the percent population living under poverty lines in different countries varies vastly. From a staggering 82.5% in Syria, 72% in Zimbabwe, 54% in Yemen, 15% in US to merely 3.8% in Ukraine. While global statistics are staggering and give a picture of the world as a whole, each country has its own standards to define poverty and in turn their own definition of the population below poverty line. As for India, the poverty line is drawn at $3.20 per day making it fall in the lower middle-income category according to 2011 data. According to a report by World Bank Group and UNICEF (Ending Extreme Poverty: A Focus on Children), around 30% of the world’s 385 million children living in extreme poverty are in India making the figure the highest in South Asia. Even the most developed countries have a chunk of their population living without adequate resources. The battle against poverty has been uneven according to the World Bank Group. According to 2015 reports, 10% of the world’s population lives below the International Poverty Line as compared to 11% in 2013 and 36% in 1990. This amounts to a reduction of nearly 1.1 billion from 1990 in the below poverty line stratum. In 1990, population below poverty line was 1.85 billion and in 2015 it was 756 million. While some regions have managed to reduce poverty to below 3%, in some regions of Africa the poverty has increased. Majority of global poor population live in rural areas, are poorly educated, employed in agricultural sector and under 18 years of age. Some economies seem to be in a sort of poverty trap which is a spiralling mechanism which doesn’t let the poor to escape poverty and might even pull others into the abyss. This is mostly seen in developing and under-developed countries due to lack of capital and credit for people. Where on one hand India’s and global poverty seem to differ, there is a completely different notion within each national economy differentiating rural and urban poverty. Earlier, poverty was thought of as a rural phenomenon, but with urbanisation pouring in rapidly, poverty in urban areas was realised. While rural poverty might comprise people not getting 2 square meals a day, urban poverty is different and might involve living in unsafe and unhygienic housing and deteriorated standards of living which is very much present in India. The slums in urban areas of India reflect the urban poverty condition. The International Monetary Fund (IMF) states that poverty usually entails deprivation, vulnerability and powerlessness. These issues are sometimes inflicted on certain individuals or groups more than others like women and children might experience poverty more intensely than men and minorities tend to suffer more greatly than other groups. The World Bank found that urban populations in developing countries like India are growing rapidly, at a rate of 70 million new city-dwellers per year. The IMF reports that 63% of the world’s impoverished live in rural areas. Education, health care and sanitation are all lacking in rural environments. Former residents of rural areas are typically drawn to the city for the perceived wealth of economic opportunities, which is usually not true. This gives rise to urban poverty as the jobs are limited in number and usually given to those who are skilled. This leads to increase in urban poverty. Urban poor in India, residing in urban outskirts or slums experience poverty in form of discrimination, unsafe housing and unhygienic environment. As if it was not enough to be a poor, the below poverty line concept which signifies that the people are earning enough to remain among the poor community, was defined by the Government of India. These people living below poverty line in India are given the BPL cards to make the both ends meet but the problem was not solved due to various factors. The Government of India says that the poverty line for rural areas is Rs.816/- per month and Rs.1000/- per month for Urban areas. It means that people living below poverty line are not able to earn this much in a month. Now, India is proposing an official poverty line at Rs.972/- (US$14) a month in rural areas and Rs.1407/- (US$21) a month in Urban areas. So, it is very much possible, that many more will go below the poverty line in India, once this standard is adopted. The average calorie requirement for a person in rural areas in India is 2400 calories per day and in urban areas it is 2100 calories per day which is not yet met. The 2012 report by the Planning Commission of India (Tendulkar Committee) reported that 26% of all people in India fall below the international poverty line of US$1.25 per day. Not generating sufficient employment, multifold increase in population without equal increase in job creation, Not using upgraded technology and following conventional agriculture farming leading to low produce and low income, division and sub-division of agriculture land leading to small farms, corruption in implementation of Government benefits to poor schemes, political vote banks are only some of the reasons which have aggravated the poverty problem in India instead of taking the country out of this menace during last 60 years. In 1947 the average income in India was similar to South Korea. While South Korea became a developed country by the 2000 India has continued struggling against the poverty without any substantial success. For the first 40 years, India followed the economic planning, nationalization programs and government ownership of industry as done in Soviet erstwhile USSR. India’s economic growth averaged at 3.5%, while other Asian economies such as South Korea grew on average more than twice that rate annually. The per capita income in India grew at 1.49% annually, while incomes of South Koreans - rich and poor - rose rapidly. Accordingly, the steps and solutions which are now being taken to eradicate poverty from India are more direct than earlier. This scheme was launched in 2011 by the Ministry of Rural Development. It aims at providing employment to the rural poor so that they have a regular income on a monthly basis. To do so, self help groups are formed in the villages to help those in need. It is often seen that though numerous programs and schemes are started to help those in need, the assets do not reach the people who are in most need of them, be it due to lack of awareness, exploitation or other reasons. The Fight Hunger First initiative was taken up by the government in 2011 to improve access of communities to the rights and entitlements accrued to them by the government schemes like employment, child nutrition, primary education and food supplies. This initiative focused on 5 of the most backward states of India i.e. Madhya Pradesh, Jharkhand, Orissa, West Bengal and Karnataka. FHFI seeks to support community and grass-root organizations in activating the Indian authorities to provide minimum social support in the sectors mentioned above. The Food Security Bill was tabled in the Parliament in 2011 and became an act on 12 September 2013 making it one of the largest food security schemes across the world. Under the provisions of this law, beneficiaries would get five kg of grains per person per month, including rice at Rs. 3 per kg, wheat at Rs. 2 per kg and coarse grains at Re 1 per kg. The bill proposes meal entitlement to specific groups, including pregnant women and lactating mothers, children between six months and 14 years, malnourished kids, people affected by disaster, and those who are destitute, homeless and starving. The roll out entails covering 75% of the rural population, since they happen to be the most deprived section in the society, and up to 50% of the urban population. According to information provided by the Ministry of Consumer Affairs, Food and Public Distribution in Lok Sabha on 25 July 2017, all the ration shops in Chandigarh and Puducherry have been closed. These two union territories were to be allocated 91,584 tonnes of food grains for distribution among 857,000 consumers which has been stopped from the year 2017-18 and replaced by direct cash transfers so that people use the ‘cash’ to buy goods of their choice from open markets. This might hinder the progress of food security in the regions. This scheme was launched by the Cabinet in March 2015 to provide skill training to 1.4 million youth with an overlay of Rs 1120 crore. This is done in partnership with the Ministry of Skill Development and Entrepreneurship via the National Skill Development Corporation. It focuses on helping entrants into the labour market catering to X and XII dropouts. Just before the State elections 2018 in Madhya Pradesh, Rajasthan and Chhattisgarh, the government waived farmers’ loans thus freeing them of the debt they were facing. Previously in 2016, such steps were seen in Telangana and some other states. This step was both praised and criticised as though it was a temporary relief from the debts, it wasn’t a long-term solution to the main problem at hand. The Government of India announced 10% reservation for the economically weaker groups in general category on 7 January 2019. The Union Minister said that those who earn less than Rs 8 lakh a year and have less than 5 acres land ownership will be eligible to avail the quota. This is a global initiative started by World Food Programme (WFP) that ensues global partnership and aims at reducing the causes and effects of child hunger and undernutrition. It aims to mobilise resources for actions on national levels to build awareness and address the issue on a global scale. On any given day, WFP has 5,000 trucks, 20 ships and 92 planes on the move, delivering food and other assistance to those in most need. Every year, they distribute more than 15 billion rations at an estimated average cost per ration of US$ 0.31. Agenda 2030 is the shortened name given to the Sustainable Development Goals (SDGs) are 17 goals set by the UN General Assembly in 2015. The top two goals of the agenda are to “End Poverty in all its forms, everywhere” and “End Hunger, achieve food security and improved nutrition, and promote sustainable agriculture”. This shows that the need of the hour is focusing on the poverty and its most drastic side effect of hunger. Most countries lack data on poverty and especially child poverty and thus it makes it difficult to make projections for the future. Mercy Corps worked closely with private sector partners, other NGOs, academic and research institutions, the faith community and Members of Congress to help pass H.R. 5129 and S. 2269 amendment bills. This bill ensures the Global Food Security Act’s improvements to the Global Food Security Strategy and the Feed the Future Initiative will continue beyond 2018.